The Whore of Babylon, from Folio 43, the Bamberg Apocalypse, Bamberg State Library, Germany, early 11th C.
The AIC’s Revelation series moves closer to the end of the series with Episode Twenty-two, The Harlot of Babylon and Her Beast, focused on Chapter 17. 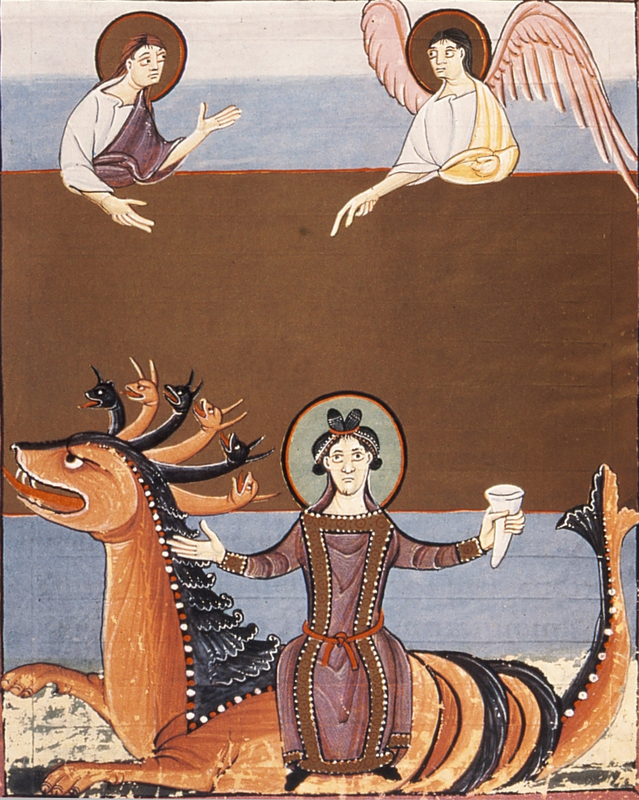 There is only one new illustration, from Folio 43, the Bamberg Apocalypse, The Whore of Babylon. As you see, the title follows the King James text while title follows the less inflammatory version used in the New King James Version. In this episode there is more of St. John’s “world upside down” parody and, even more than usual, back references to Hebrew history and Scripture, numerology (7 and 10), and another reference to “mysteries” being finished. In this chapter St. John does explain at the end some of the phrases he uses at the beginning of the chapter. My favorite part is the line about the kings getting to rule for “one hour”! Also uploaded this week is my Podcast Homily for Fifteenth Sunday After Trinity, based on Galatians 6:11-18 and Matthew 6:24-34. I have also added Matthew 6:19-21 to put the reference to “Mammon” into its proper spiritual context rather than leave the focus on its literal meaning. This week will end with my review meeting with my cardiologist. I will let you know via today’s edition of the Weekly Update what, if anything, has been decided. I am also working on Episode 27, focused on Chapter 21, which is the next-to-last chapter in Revelation. In Chapter 21 St. John turns from John the Dramatist to John the Poet. The Chapter is so loaded with more back-references and repeat material that I am having difficulty getting the context correct without too much repetition of material already presented. I expect to complete the episode late next week, after which I will start on preparing the final Episode of the series, focused on Chapter 22. May God bless you now and in the coming week in all that you do in His Name. Amen! Glory be to God for all things! Amen!